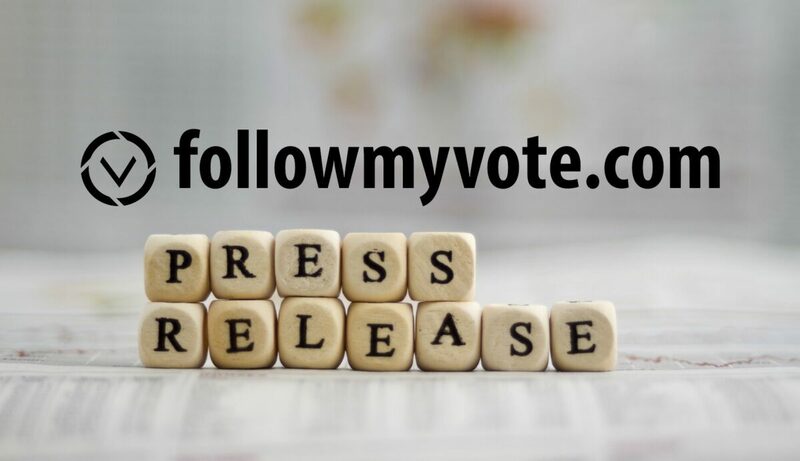 FOLLOW MY VOTE RELEASES ALPHA FOR STAKEWEIGHTED BLOCKCHAIN VOTING SOFTWARE. Blacksburg, VA — Blockchain voting company, Follow My Vote, has released the Alpha version of their stake weighted voting software. The alpha version runs on a blockchain using the open-source Graphene Blockchain Framework architected and developed by Follow My Vote CTO, Nathan Hourt and Dan Larimer of Steemit Inc. Other projects that have utilized Graphene include BitShares, Steem, and Muse. Features and functionality that can be explored in the alpha release include publishing of contests, casting votes, and tallying contest results. TLS Encryption using the blockchain as the certificate authority has also been established for client and server communication. This release follows the recent crowdfunding success of Follow My Vote on Kickstarter. On July 4th, the team achieved their funding goal for their Parallel Presidential Election Experience. One of the most popular rewards offered during their Kickstarter campaign was MERITs, which are digital crypto-currency tokens. When Follow My Vote is deciding on features to build into their open-source software, they will run stake-weighted polls within the voting software to prioritize development based on market demand. These polls will be weighted in MERIT. Therefore, holders of MERIT will help set the direction of Follow My Vote’s software development. Follow My Vote develops open-source blockchain voting software that supports early voting from mobile devices and provides immediate transparency into election results by allowing voters to independently audit the ballot box to ensure that election results are honest. Blacksburg, VA — To improve voting across the United States, The Free and Equal Elections Foundation is working closely together with blockchain voting company, Follow My Vote. The Free and Equal Elections Foundation and Follow My Vote will be exhibiting alongside each other in Los Angeles at Politicon on June 25th and 26th. The Politicon convention fuses satire, seriousness, and political celebrities. The Free and Equal Elections Foundation will also host a panel at Politicon with Follow My Vote CEO, Adam Ernest, as a panelist. FOLLOW MY VOTE LAUNCHES CROWDFUNDING CAMPAIGN FOR VERIFIABLE OPEN-SOURCE BLOCKCHAIN VOTING SOFTWARE, MAKING VOTING HONEST AND CONVENIENT, ONCE AND FOR ALL. Blacksburg, VA — On April 13, 2016, Follow My Vote launched a Kickstarter campaign to help fund the voting platform of the future, powered by blockchain technology. The project aims to bring transparency, convenience, and security to elections and polls of all kinds. Voting today is filled with accusations of illegitimacy. This is mostly due to the current systems and methods in use, which can be extremely vulnerable. Follow My Vote is solving this voting crisis with innovative technologies. A voting platform that can gain transparency into elections, without compromising voter privacy will ensure that election results are accurate. Follow My Vote is accomplishing this by using blockchain technology and elliptic curve cryptography to build an open-source platform that is secure and truly verifiable from end to end. The funds raised from their Kickstarter crowdfunding campaign will go towards completion of the project and demonstrating the power of blockchain voting to the world. Follow My Vote plans to demonstrate their game-changing technology by hosting an election in parallel to the U.S. 2016 Presidential Election. They are now allowing people to sign up to participate.